Once baked and golden brown allow the savarins to cool at least half an hour before the next stage. 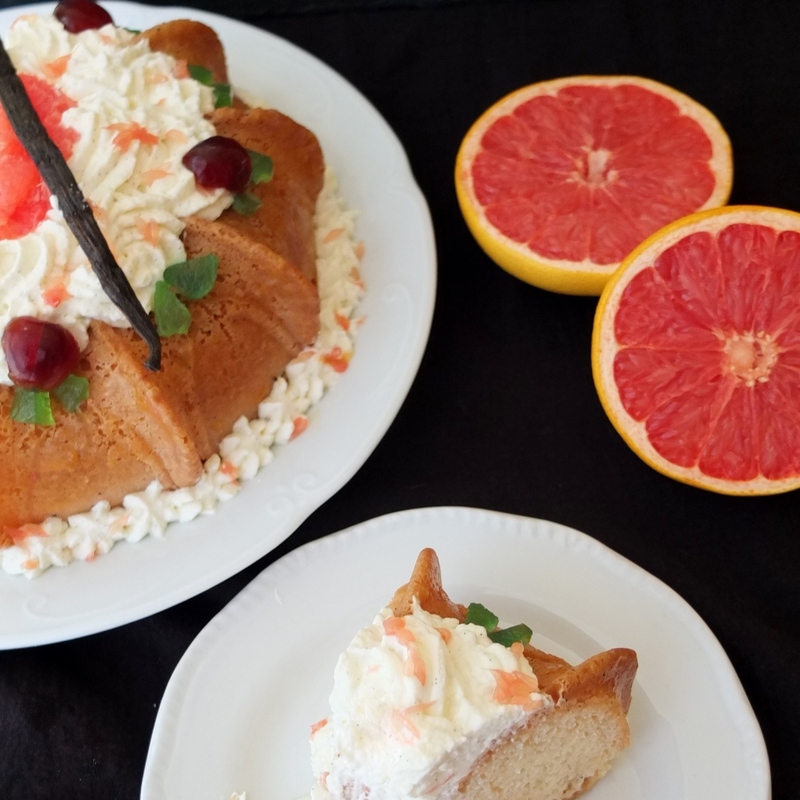 This recipe was invented based on the idea of a balanced syrup that is neither too sharp nor too sweet, with enough to completely soak and moisten the savarin. Then there’s loads of cream with a more subtle flavour and sweetness. 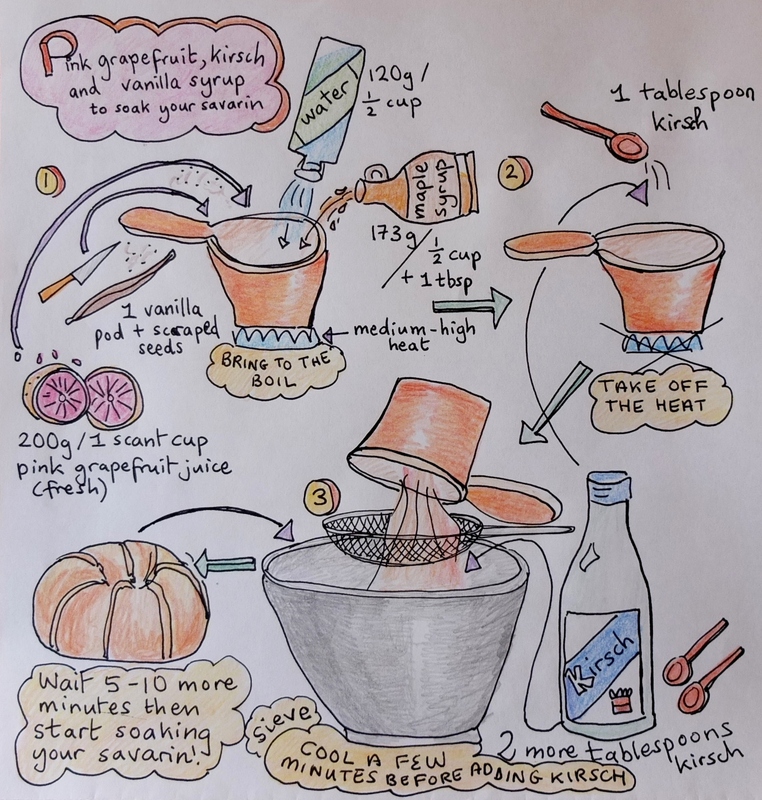 The vanilla and maple syrup are hovering in the background supporting the main stars: pink grapefruit and kirsch, who are not fighting each other but being friends and holding hands. 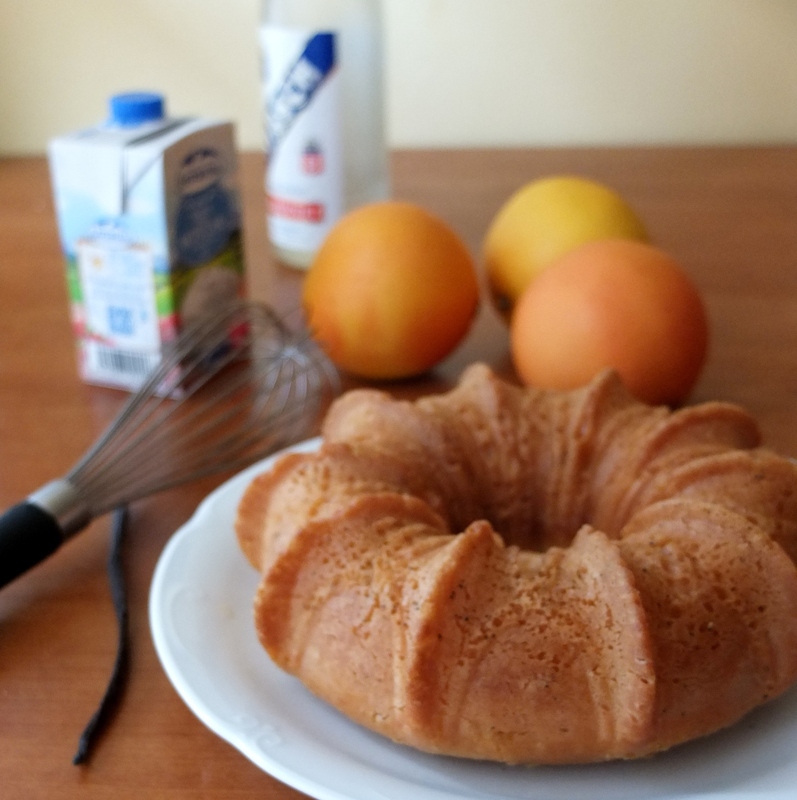 To make the savarin: 30 mins work over a stretch of 2-3 hours and 15-40 mins baking. 5 mins for the syrup and 5-10 minutes for the cream. 10 minutes for assembly. Total: 50-55 mins work. If you’re using frozen savarin dough a total of 25-30 mins work. Soaking and assembling is faster with a single large savarin than with 8 small ones. Over 2 days: You can bake the savarin(s) and soak in syrup the previous day, as I did this time. 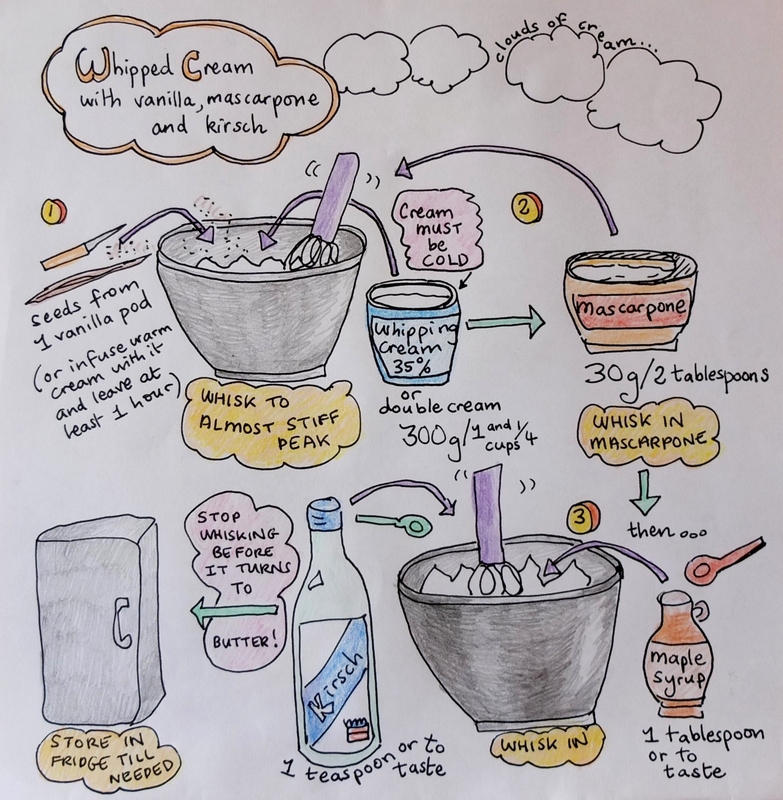 Refrigerate in an airtight container then the following day whip the cream and assemble. Please follow the recipe on my Savarins page. You use half the dough and freeze the other half. My halves weighed between 210g to 230g/8oz each. 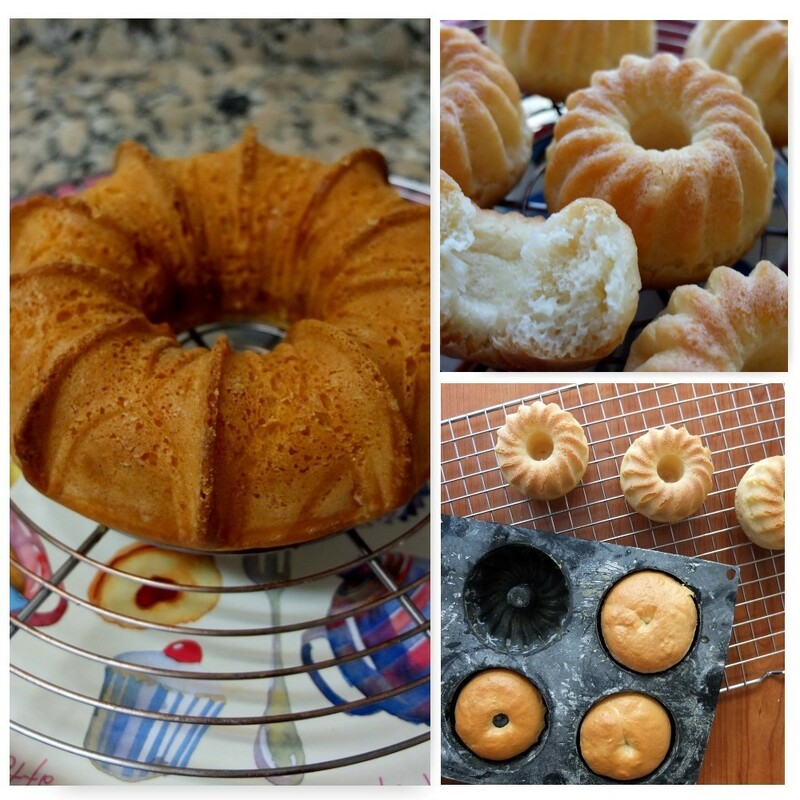 You can make a big savarin or 8 small ones. 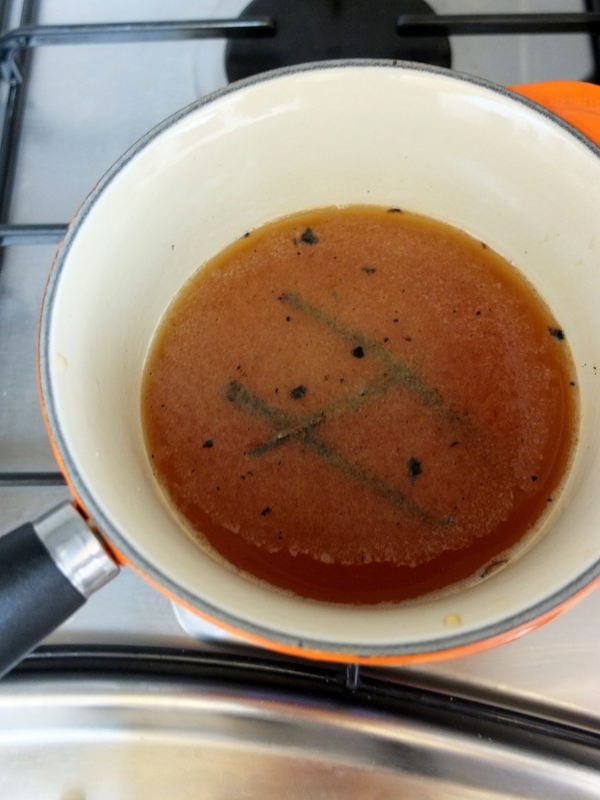 Your syrup should be fairly hot (around 48°C/120°F) but not very. If you like a stronger taste of alcohol (taste the syrup now) add a tablespoon or 2 of kirsch. Prepare a wire rack over a tray to catch the dripping syrup. Soak the savarin completely in your big bowl of syrup for 30 seconds to 1 minute. Take the savarin out delicately making sure it doesn’t break. If the top has not been soaked, turn it upside down and repeat step 3. Repeat steps 3 and 4 if necessary. The savarin need to soak the syrup up like a sponge until it’s heavy and completely moist. But it shouldn’t fall apart. If the level of syrup is getting low then place the savarin carefully on the wire rack and brush syrup over it. Use the syrup that’s dripped into the tray to keep brushing the savarin. Allow to cool completely (or overnight) before decorating with the cream. Notes: for a stronger vanilla flavour bring the cream to a simmer with the vanilla then infuse for an hour or so and chill the cream well before using. The mascarpone helps stabiliise the cream so it doesn’t flop. It’s optional and with thick double cream it’s less necessary. Brush your savarin with the apricot jam to cover completely so it glistens. 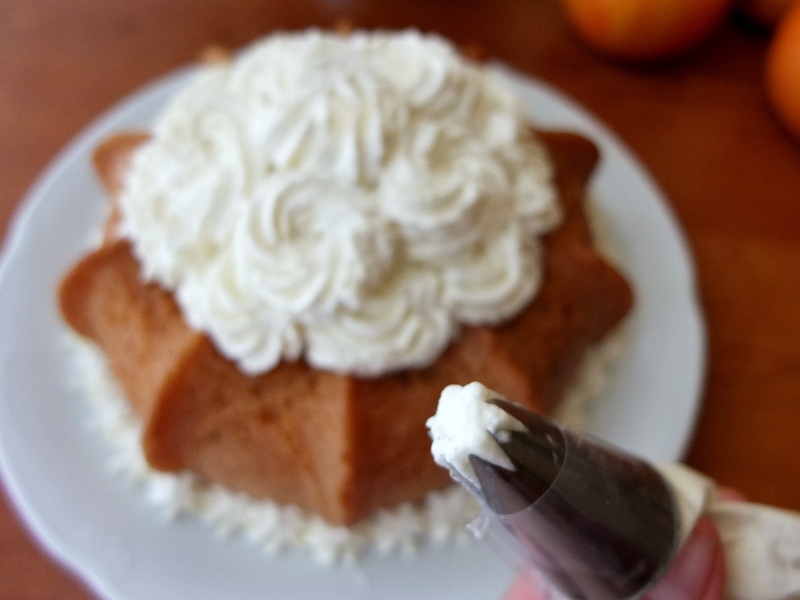 Spoon some cream in the middle hole then use a disposable piping and nozzle to pipe rosettes or swirls on top. 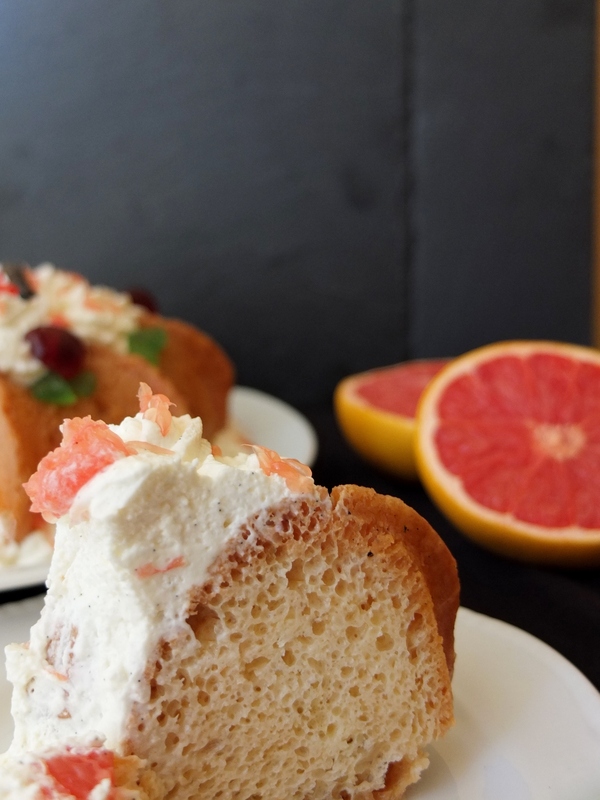 Make a rose with the grapefruit segments on top of the cream – mine’s a bit messy! 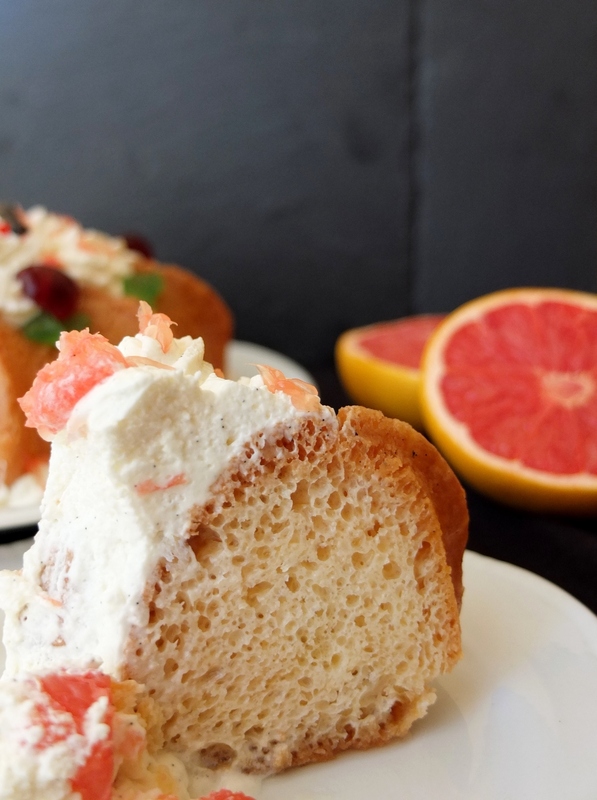 You can also sprinkle little bits of grapefruit over the cream. Then finally, if using place the glacé cherries and angelica triangles artistically on your savarin. Add a vanilla pod for a French new pâtisserie style. Tada! 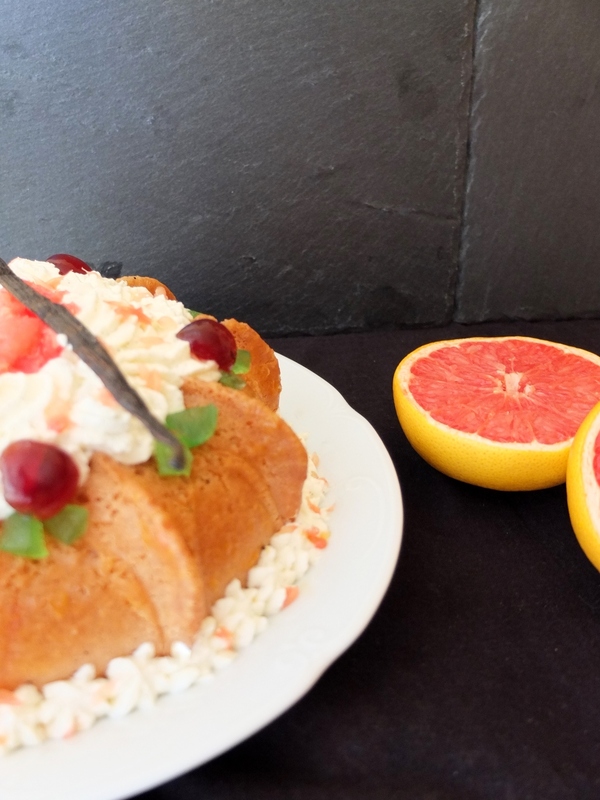 Have a slice of pink grapefruit and kirsch savarin! P.S. (A month later) Here’s mum’s birthday cake! 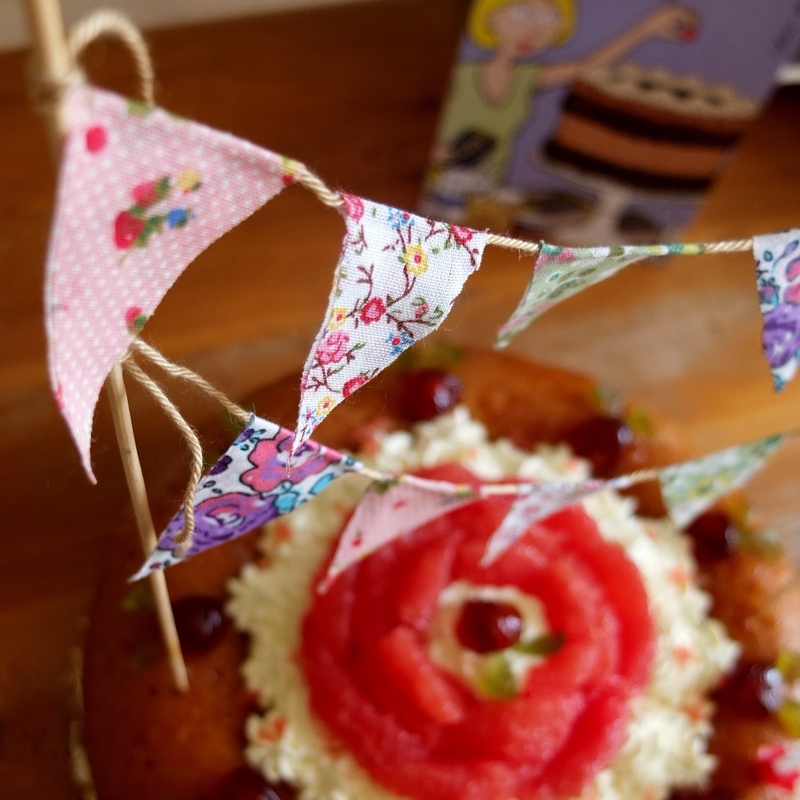 🙂 Instructions, How to make cake bunting, are in my cake decorating section.